Many marine ecologists think that the biggest single threat to marine ecosystems today is overfishing. Our appetite for fish is exceeding the oceans’ ecological limits with devastating impacts – and there is now estimated to be four times more global fishing capacity than there are fish left to catch. Giant ships are now using state-of-the-art sonar to pinpoint schools of fish quickly and accurately. These ships also have fish processing and packing plants, huge freezing systems, fishmeal processing plants, and powerful engines to drag enormous fishing gear through the ocean. According to the United Nations, over 70 percent of the world’s fisheries are either ‘fully exploited’, ‘over exploited’ or significantly depleted’. Some species have already been fished to commercial extinction, and more are on the verge of extinction. Regulation of fishing vessels is universally inadequate. More often than not, the fishing industry is given access to fish stocks before the longer term impact of their fishing practices is understood. Overfishing is causing profound changes in our oceans, perhaps changing them forever. Over 90 per cent of large predatory fish, such as cod and tuna, have already been caught. Fishermen have responded by changing to new target species, often renaming them to make them sound more appealing to consumers. Hence the Patagonian Toothfish was reinvented as Chilean Seabass, while the wonderfully named Slimehead metamorphosed into the Orange Roughy. But as the larger species get fished out, fishermen are increasingly forced to look further down the food chain. Overfishing doesn’t only threaten the fish species we target for food. Other species – such as marine mammals and seabirds – are caught incidentally in fishing gear and killed. This is known in the trade by the innocuous sounding word ‘bycatch‘. Even worse, many – if not most – modern fishing methods are seriously destructive. 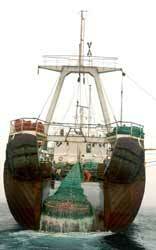 Bottom trawling, for example, can destroy entire habitats found on the ocean floor. The impacts are felt throughout the marine ecosystems. Scientists are already warning that the oceans will suffer profound changes as a result of overfishing and destructive fishing practices.